My hoard of accessories. Well, partial hoard actually. In this part of the world, several of the most striking things about the local women are their accessories that they put on no matter what the occasion is even if they are just going about their daily activities. And because I want to somehow blend in with the local and get a taste of what it's like to be a local settler, I bought some of their MUST HAVE accessories and let me share it with them with you here so keep on reading. Yours truly applying kajal on my eyes for the first time. I consider this as the most used and most common accessory that local women here (and even men and children at times) enjoy. Basically, a kajal is an eyeliner made up of kohl and even if its main purpose is to highlight the eyes, there are some locals who wear kajal for religious purposes. There are so many make-up brands that sell kajal here and the prices range (as far as I know) from as cheap as less than 20INR to as pricey as 300INR. 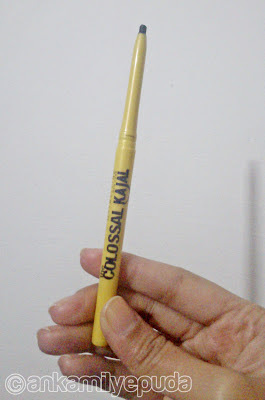 Maybelline Colossal Kajal - specifically made for Indian women's kajal needs. Another very famous and a definitely must have accessory for every Indian woman is the bindi. A bindi is worn on the forehead and again, while it is considered as a fashionable accessory for women, it is also worn for religious purposes by some well, religious people. In a local market, bindis come in different sizes, shapes, colors and of course, price. The cheapest bindi set will cost you around 20INR and a pricey one can cost an individual thousands of bucks or even millions if it is made from gold and expensive stones such as diamonds. 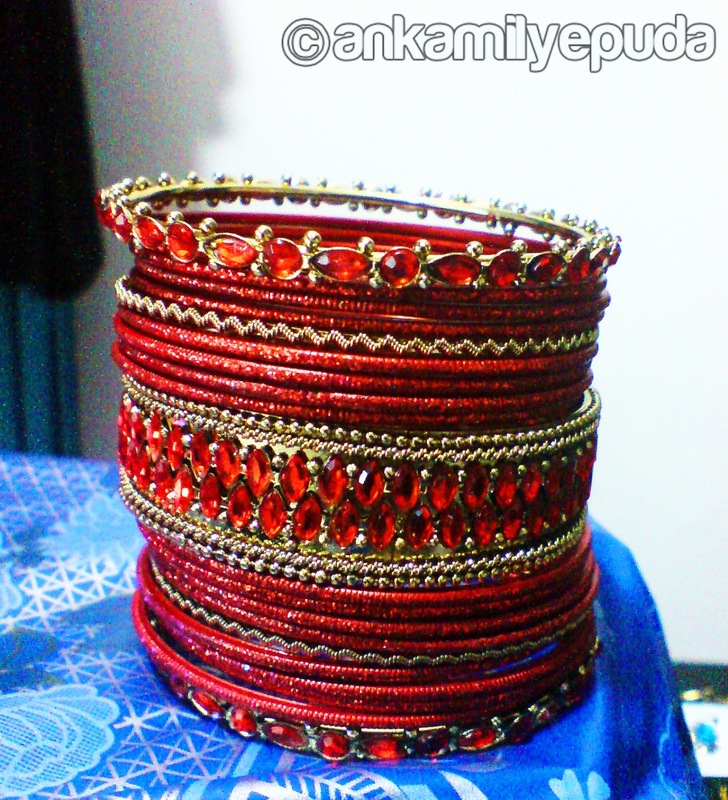 A local fashion experience will never be complete if you will not wear a beautiful set of bangles. Aside from bangles being a type of fashion accessories for women, it can also serve as an indicator that a woman got married recently. 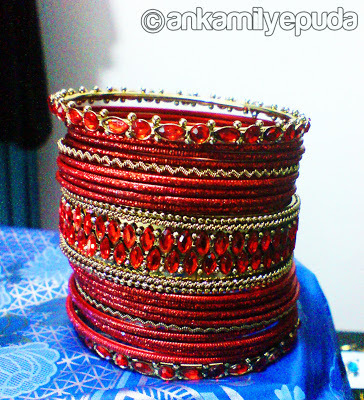 A newly wed woman will wear a set of white and red bangles to symbolize her marriage that recently took place. In addition to that, people who are more on the traditional side believes that every bangles color signifies something such as wealth, power and prosperity. But if an individual, a foreigner like me for example, wants to wear a set of bangles just like that, I think that is just fine although I should be ready to receive the inquiring looks and weird stares from locals when I am passing by especially if I chose to wear a white and red set of bangles. Can you count how many individual bangle makes up the entire set? People can actually consider India as the accessory capital of the world especially when it comes to earrings. There's just so many kinds of designs, colors and sizes of earrings in here. If you are willing to submit your pair of ears for a couple of hours of torture, you can buy those big and heavy looking pair of earrings that will definitely pull your lower ear lobes down. I only bought those cheap fancy earrings found on the sidewalks since I don't find the huge, heavy and chunky ones appealing and there's really no event where I can use them and most of all, I don't want to harass my ears. Hehehe! Some of my cheap but beautiful Indian earrings. So there goes my take on the MUST HAVE accessories if ever you find yourself one day traveling towards this part of the planet. These accessories are pretty affordable to even dirt cheap, if you know where to buy and you are not afraid/shy to haggle, that you will not have to worry about not having enough budget for these trinkets. What about you? What is the MUST HAVE accessories in your side of the world? I adore people who wear alot of accessories! its fun! I just do hope I can do it:) thank you for sharing! Women and Fashion go side by side. Be on top with latest fashion accessories. Many wear designer outfits are being worn with heavy embroidery and colored embellishments stitched onto the materials. Bridal jewelry sets are worn to match each outfit. Brides look resplendent in their Indian bridal wear though all the pet houses jewelry worn is not necessarily pure gold. Ankamil Yepuda --- A Jane of All Trades. A Master of None. © All texts and images on this site are owned by ankamilyepuda unless stated otherwise. Copyright. Simple theme. Powered by Blogger.